Efavormart 36'' x 100ft Floral Lace Aisle Runner by Efavormart.com at Party Outlet Express. Hurry! Limited time offer. Offer valid only while supplies last. 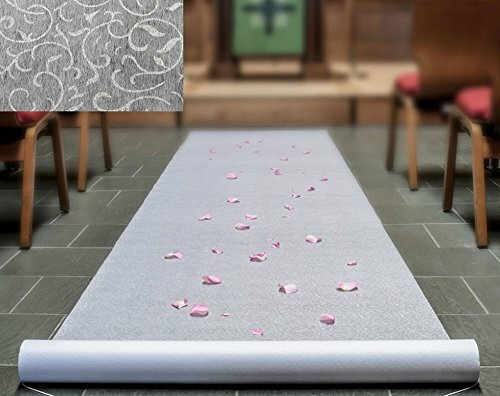 Ideal for indoor or outdoor ceremonies.high-quality rayon aisle runner is beautiful with its detailed floral design throughout the non-woven fabric. Ideal for indoor or outdoor ceremonies. high-quality rayon aisle runner is beautiful with its detailed floral design throughout the non-woven fabric. Simple yet Elegant choice for Your Grand Walk, Down-The-Aisle. Pull Cord - Included.Perfect for wedding receptions,party, banquet, events, Any occasions you can think of! Ideal for indoor or outdoor ceremonies.high-quality rayon aisle runner is beautiful with its detailed floral design throughout the non-woven fabric. Simple yet Elegant choice for Your Grand Walk, Down-The-Aisle.Size: 36" Wide by 100' LongPull Cord - Included.